RPNow does now allow certain programs to be running while in the software. If you have received a Prohibited Processes Running message, similar to the message below indicating a process isn't allowed, you'll need to stop this application(S) from running. The simplest way to solve this issue is to click the “Continue” button. This should close all Prohibited Processes that are running. NOTE: Please be sure to save any important work before clicking the “Continue” button. 2. 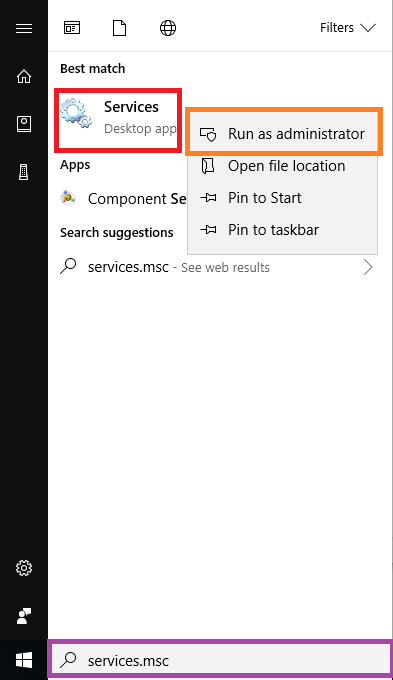 Right click on Services- Desktop app and select Run as Administrator. 3. On the list of Services, Look for the prohibited process (Teamviewer11. Youcam. TVNserver, etc.). 4. Highlight and Right click on the service and select Stop (Or on the screenshot, the stop option is also on the side). 5. Go back to RPnow and hit Continue or Relaunch RPnow. If you have any further issues after following the steps above, please contact our Technical Support Team.